San Antonio aviation post card, barracks and quarter, San Antonio aviation cadet center, San Antonio , TX., ten acres of flying cadets. Published by San Antonio card co., San Antonio, TX., excellent, unused, condition. 5 1/2" x 3 1/2". 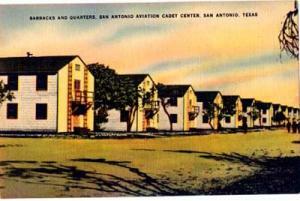 Items Similar To "San Antonio aviation post card, barracks and quarter postcard, 40..."